Edibleculture for fruit tree pruning, garden design, garden maintainance. Orchards are more than just for fruit. They provide a rich environment for wildlife and lovely place to relax and enjoy. Pruning is vital for the tree to be productive and healthy, at Edibleculture we offer a complete service and like to explain why we do certain techniques. 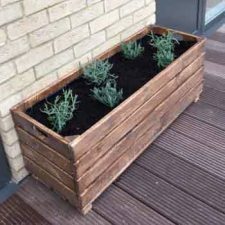 We design and make our own range of crate planters and vertical planters from sustainable wood. Ideal for Dwarf fruit trees or edging a concrete area. We can create a productive, easily maintained and attractive space both for you and wildlife! Its through years of experience we can advise on getting fruit trees that work! From planning a orchard for a community group through to reviving your garden its not always advisable to just take pot luck. Soil condition, pollination.. to name just a couple of things to consider when starting off. As fruit tree advisers our skill is defining the best trees for the right conditions at the best prices. We can supply heritage/rare varieties.. we can have a tree you already own re-grafted.. Fill in the form below with your enquiry and we will get right back to you. When it comes to pruning it is a subtle balance of recognising what is best for fruit production and the overall health of the tree. To prune a ‘Tip Bearing’ tree like Bramley it is important to recognise you are are not removing next years fruit! Stone fruit like cherry, plum and apricot should not be pruned in the winter as it opens the tree to infection.. post cropping is the best time. At Edibleculture we can take the guess work out of the job, we have a range of maintenance plans which means you know we will attend to your trees at the right time to address issues like disease or a major prune. A trained tree is a great addition to garden if you want variety and your space is limited. 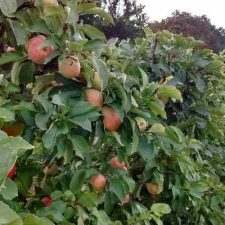 We consider this style of planting to be our speciality.. Spacing, wire height, choosing the right varieties, positioning the right fruit trees where… its a bit of minefield. Get it right you will have a wall of fruit season after season, we can supply, plant and maintain. Trained trees are good if your soil is heavy (London Clay for example), they are grown on Vigorous stock and have the ability to spread about 4 metres. If you need guidance or you want to buy trees come to us!